For more than 50 years, we have been developing and manufacturing polymer optical components and complex optomechanical electronic systems for our customers using sophisticated injection molding process. Jenoptik designs, develops, manufactures and assembles highly complex polymer optical systems and components: We offer extremely high performance and precise polymer micro optics. With a variety of dimensions, geometries and coatings available, they match your specific applications perfectly. We use lightweight polymers and cover the complete technology chain - from the design of parts, modern 2K injection molding processes and highly technical tool construction through to specialized coating technology. We are constantly developing our technologies and processes further, so our production methods and capacities ensure you benefit from the most efficient production processes - from prototypes through to large-scale series production. Working together with various institutions and our business partners, we actively participate in the latest research in the field of polymer optical components. We focus on the development of microoptics injection molding coating technology and assembly technologies. This means you benefit from state-of-the-art polymer optics, which are integrated into your system using the latest technology. Benefit from our expertise: Jenoptik experts support you throughout the entire development process. 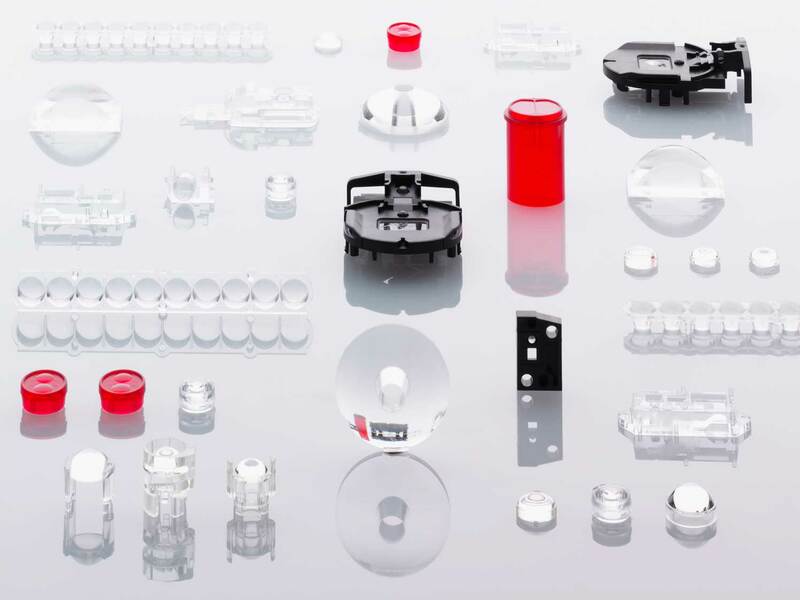 Our services range from the specific design of the polymer optical component, assembly, concept and prototype testing through to mass production with multiple injection molding processes, optoelectronic assembly and packing. We also provide product and feasibility studies for optimum quality management. In system manufacturing, we use mechanical joining and connection technology. We also use injection molding with fully and partially automated processes, as well as manual processes. Depending on your product requirements, the individual production steps are performed in cleanroom classes 100,000 to 100. This prevents unwanted particles entering the air, and allows us to ensure consistent conditions at all times. Jenoptik delivers micro-assembly based on packaging technology for optoelectronic and optomechanical systems in the process chain. All technology steps ensure synergies. From wafer coating through to the manufacturing and encapsulation of microchips and high-precision positioning of optical components (<<10 µm), all processes are extremely efficient. This enables Jenoptik to deliver a compact, customer-specific system design with consistently high quality — from prototypes through to series production. In the USA, we are represented by JENOPTIK Optical Systems, Inc. This branch also delivers a range of services in the area of polymer optics: optical design of imaging and non-imaging components and assemblies, manufactured systems, unit cost estimates and project management. Complete technology chain: Design, development, manufacture and assembly. Customer-specific: Highly complex components and systems for your specific applications. Leading manufacturer: Benefit from our expert knowledge and high-tech methods. Vertical integration: From prototypes to large-scale series production. Tested: We perform product and feasibility studies. Jenoptik’s successful history as a supplier of polymer optical components goes back more than 50 years. Since then, we have continuously grown and serve markets around the world - from the consumer goods and automotive industries through to medical and military applications. This means that we can offer a wealth of experience in many different areas. Since 1995, for example, we have supplied the market with over 100 million blood glucose meters. Jenoptik is also the only manufacturer of polymer optics in Europe that is certified pursuant to ISO9001/TS 16949 - a global quality standard in the automotive industry. As a reliable partner, we currently deliver more than ten million polymer-based systems a year, produced in our four German branches.